Over 1500 delegates from across Africa and beyond are in Kigali for a continental private sector meeting dubbed, Africa CEO Summit. The summit, which is arguably the continent's largest international meeting of Africa's private sector, brings together CEOs from top companies, international investors, experts and high-level policy makers from the continent and beyond. It is a platform where business leaders deliberate on issues affecting them like opportunities for growth, key challenges and pitching to international investors the business opportunities on the continent. Held annually,the Forum is organized by Jeune Afrique Media Group; Rainbow Unlimited, a Swiss company specialising in the organisation of economic promotion events, and International Finance Cooperation, the lending arm of Word Bank Group. The summit's deliberation and sessions are themed around using regional integration to drive private sector growth. At the summit, companies from select countries, including Rwanda, will present investment projects during side sessions billed to have a cumulative value of about $700 million in promising growth sectors. This will enable about 30 African companies with potential to meet with investors interested in financing their growth. The 30 participating firms, with an average turnover of $50m are seeking financing packages worth between €25m and €100m. The financiers include the continent's largest banks, pension funds, private equity players, among other international financial institutions on the continent. The companies that will be seeking financing come from multiple sectors, including financial services, real estate, tourism, health, manufacturing, energy, agriculture and ICT. Over 1500 delegates from across Africa and beyond are in Kigali to attend the Africa CEO summit that kicks in today. Nadege Imbabazi. According to organisers of the summit, it will also be an opportunity for the continent's private sector to point out integration issues they would want fast-tracked as well as engage political leaders on ways to fast-track integration initiatives such as African Continental Free Trade Area. For instance, deliberations will among other subjects cover the other prerequisites necessary to implement and rollout the African Continental Free Trade Area agreement. "A long negotiation phase is now underway with the aim of eliminating customs tariffs, but greater change is needed if this initiative is to succeed. Logistical and financial barriers, a lack of inter-government coordination, the low level of national economic specialisation and the fear of facing increased competition from companies based in neighbouring countries are all factors that hamper intra-African trade, and explain the modest size of continental champions," a concept note reads. The meeting will also discuss and address key challenges for Africa's private sector, including the representation of top women executives in the boardrooms and the modernisation of family business governance. 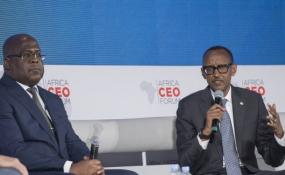 Speaking ahead of the opening of the forum, Rwanda Development Deputy Chief Executive Officer Emmanuel Hategeka said that for Rwanda, the summit is an ideal opportunity to showcase potential investment opportunities. At the summit, Rwanda will showcase opportunities in agro-processing as well as innovation and technology. In ICT, the main opportunities include Kigali Innovation City. In agro-processing, he said that the largest opportunities are in high-end nutritious foods. The summit will also go a long way in helping to achieving conferences sub-sector targets of about $88m in 2019. A number of heads of state are expected to address the summit, including Ethiopia's Sahle-Work Zewde, Togo's Faure Gnassingbé, and Democratic Republic of Congo's Felix Tshisekedi.